Plus Interiors provides full-service custom cabinetry, including design, manufacturing, installation and warranty. We have partnered with Stosa, a leader in Italian cabinetry, and Cleaf, the world's best board manufacturer, to provide our customers with innovative options and personalized design expertise. As we move into our third decade of business here in Hawaii, we remain committed to our customers, to quality manufacturing, and to a company culture that encourages innovation and thoughtful design. Visit our showroom for an interactive experience to find the style, finishes and accessories that suit your project needs. We have a wide assortment of quality products to choose from. Our local design team offers full-service design assistance, fabrication, install and warranty. We provide direct, hands-on support for your project. Thanks to our unique partnerships and manufacturing expertise, we offer high quality products without the high price tags. Your new custom kitchen begins with a consultation with one of our expert kitchen designers. We’ll ask questions to help us uncover your needs, budget and ideas for the space. Once equipped with your design requirements, we’ll design a layout of your kitchen using our CAD software. This will show you how the space will look and function. We’ll provide an estimate of the project costs based on finishes, lighting and accessories. Together, we’ll make changes until the design is exactly what you want. Once your designs are finalized, you’ll sign a contract and your order will be placed. Project lead times vary based on the design and finishes, all of which will be discussed in detail with you. We will coordinate a delivery or installation date based on the project completion date and ensure adequate, timely communication throughout the process. After your installation, we’ll follow up to ensure your satisfaction. Then comes the fun part where you get to live in and enjoy a space that was crafted specially for you. We offer our clients two product options to meet their project needs. Plus Interiors cabinetry is locally manufactured with short turnaround times and a locally inspired aesthetic. 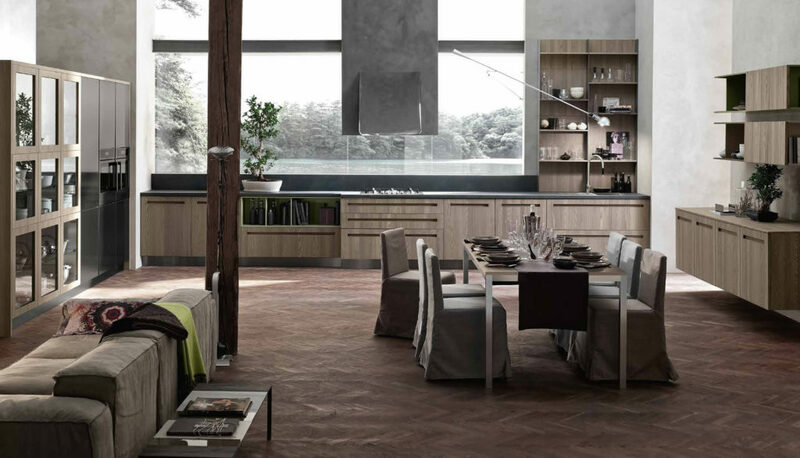 Stosa cabinetry has been exclusively designed and crafted in Italy for over 50 years, providing a wealth of Italian design options, quality construction and innovative materials. Our design options are tailored to each client's individual preferences. We manufacture most of what we sell at our facility in Kapolei. By partnering with industry leaders, we ensure our clients have access to best-in-class material selection, lighting, accessories and more.